ST. LOUIS (February 11, 2014) – International Mulch Company™ (IMC), announced today the rebranding of its hallmark Rubberific product line. This rebranding initiative includes a new logo and a complete redesign of all packaging that will be debut across North America in the spring of 2014. 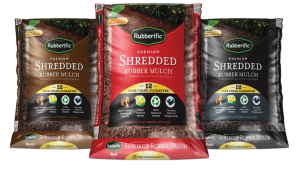 Rubberific Mulch, the only rubber mulch that looks identical to wood mulch on the market today, was introduced when IMC opened its doors in late 2000 and is now sold both in-store and online at thousands of retail locations across the United States, at fine retailers such as: Lowe’s, Menards, Ace Hardware, True Value, Costco, Wal-Mart, BJ’s Wholesale Club, Meijer and DoitBest. The brand started with mulch but has grown to encompass a complete product line of recycled rubber products (tree rings, timbers, swing mats, landscape borders, splash blocks, pavers) for both home and commercial use, all bearing the Rubberific name. “The company took great care and consideration to identify a design team that understood this market segment and how to best communicate the abundant benefits of this product line,” said Rich Muth, Senior Director, Marketing and New Product Development at IMC. “Having previously worked with Brian Schultz while I was at Schultz and Spectrum Brands I knew the impact that his award-winning designs had with the consumer, and we knew that we should entrust Brian Schultz Design to develop the new Rubberific brand for market”. “Topped with a bold new logo, the updated design captured the attention of the IMC team as well as the retailers they presented to immediately. The final test was in the quality of the printed packages which reproduced beautifully with no compromise to the original concept,” concluded Schultz. While the look of the packaging will change, what will not change are the core values that the company was founded on and that are translated into each and every product that IMC produces: beauty, safety, longevity and doing our part to be good stewards of the land. For additional information on our full suite of recycled rubber products,please visit us at www.imcoutdoorliving.com or at www.facebook.com/rubbermulch. International Mulch Company™ (IMC) is a family-owned and operated business with its corporate headquarters located in St. Louis, Missouri and production facilities in Illinois, Maryland and California. We manufacture long-lasting landscaping and playground products made from 100 percent recycled rubber tires. To date we have recycled more than 400,000,000 pounds of rubber under the Rubberific®, NuPlay®, Re-Play®, NuScape® and Lasting Beauty® brand names.